Newspaper clippings courtesy of Mark Eastridge. The month of May 1979 started with NWA World Tag Team Champions Paul Jones and Baron Von Raschke defending their newly won belts against former champs Jimmy Snuka and Paul Orndorff on May 1st in Raleigh, North Carolina at the Dorton Arena. Jones and Raschke retained their belts on May 1st, and these two teams battled against each other all the way to the last day on the month, when the champs again walked out with their Titles in Winston Salem, North Carolina on May 31st in a unique combination Texas Tornado/Fence Match. 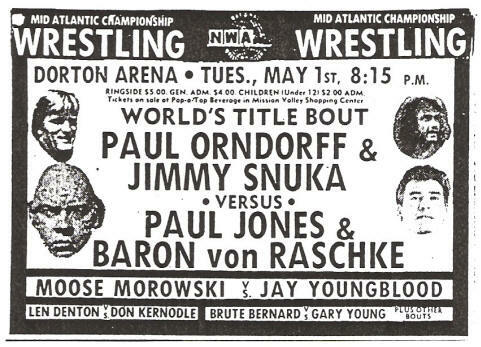 The ferocity of the bouts between Jones and Raschke and Snuka and Orndorff in many ways defined the month of May 1979 in the Mid-Atlantic Championship Wrestling area. The crafty Champions slowly but tenaciously gained control over the talented, but increasingly desperate, challengers as the month wore on. To determine who the best team was, the promotion had these four battle against each other in some interesting specialty matches. Two 90 Minute Time Limit Matches during the month pushed all four combatants to the limits of their conditioning. The two teams battled, once again, in Raleigh on May 8th and then again in Greenville, South Carolina on May 14th in exhausting 90 Minute Time Limit bouts, with Jones and the Baron emerging with their Titles. Columbia, South Carolina saw two of the rowdiest Title bouts between Paul Jones and the Baron and Snuka and Orndorff. On May 22nd, the four were matched up in a Texas Tornado championship bout, and with all four in the ring at the same time and things couldn’t have been crazier! Promoter Henry Marcus brought the two teams back together in Columbia the next week, on May 29th, and this time they were matched up in a Fence Match. Despite a number of near falls against them, Jones and Raschke scored an impressive win that went a long ways towards snuffing out for good the Title challenges of Snuka and Orndorff. While Paul Jones was active in the World Tag Team Title battles detailed above, he also maintained a hold on the NWA Television Title during the month of May. Jones’ TV Title was a stake in any singles bout during the first 15 minutes, but two matches that were billed specifically for Jones’ TV Title during May deserve special mention. On May 6th, Jones battled former partner Ricky Steamboat in Asheville, North Carolina for Jones’ NWA Television Title in a particularly rugged encounter. Then in Savannah, Georgia on May 19th, Paul put up his TV belt against none other than Rufus R. “Freight Train” Jones! Paul was able to stall out the 15 minutes, before Rufus head-butted Paul for the victory. As one could well imagine, Paul Jones had a different take on the above events. Paul said he asked Flair to come to the ring in Greensboro to take his ring jacket back to the dressing room, and then that’s when Flair was a “turncoat” and “double-crossed” him by hitting him with a steel chair. Later in the evening, when Flair was wrestling Jimmy Snuka, Jones got his revenge by interjecting himself in that match and hitting Flair with a chair, costing Ric the match! These two episodes with steel chairs created some extremely bad blood between Jones and Flair, which managed to stay under wraps for several weeks. But rather than this episode fading into the background, it actually escalated as the month of May wore on. The “Nature Boy” called Jones a “little punk,” and Jones countered that Flair couldn’t accept the fact that Paul Jones was Number One. And by the end of the month of May, Paul Jones and Ric Flair were actually wrestling against each other! 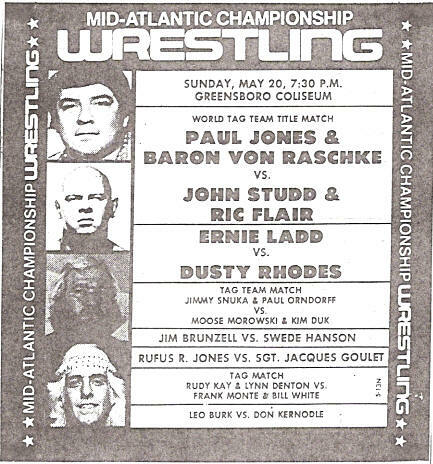 The first bout in May where Jones and Flair wrestled against each other was on May 20th in the Greensboro Coliseum, when Jones and Raschke defended their World Tag Team Titles against Flair and big John Studd in a tag team “Battle of the Bullies” contest that was as nasty as it could be, with the champs coming out victorious. Then later in the month, Jones and Flair squared off twice for Flair’s United States Title, where Jones’ NWA TV Title was also at stake for the first fifteen minutes. Both matches were mass-mayhem, which ended predictably in Double Count Out finishes. The first occurred in Charlotte, North Carolina on May 26th and more of the same bitterness between Jones and Flair took place in the Roanoke Civic Center on May 27th. Prior to the U.S. 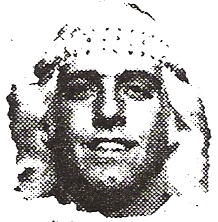 Title bouts against Paul Jones at the end of the month, Ric Flair had a steady stream of successful United States Title defenses against the area’s top good guys. Ric and Ricky Steamboat had several classic U.S. Title bouts in May, with perhaps the best being a grueling 60 minute draw in Columbia, South Carolina on May 8th. The strongman Tony Atlas also gave Flair all he could handle in May. In Norfolk, Virginia on May 10th, the “Nature Boy” pulled out a hard-fought victory over Atlas, but Tony turned the tables two weeks later in Norfolk, on May 24th, when he beat Ric by disqualification in a match where none other than Rufus R. Jones served as the special referee! Speaking of Rufus, the “Freight Train” had several exciting United States Championship matches against Ric Flair during the month of May. Two in particular were extremely rugged contests. In Spartanburg, South Carolina on May 12th and then at the Richmond Coliseum on May 18th, Rufus dominated the bouts against Ric with his head-butts, only to have the Nature Boy purposely get himself disqualified at the end to be able to walk out with his Title belt intact on both occasions. The big card in Canada during the month of May featuring the stars of Mid-Atlantic Championship Wrestling occurred on May 13th at the Maple Leaf Gardens in Toronto. The highlight of that card saw Ric Flair successfully defend his United States Heavyweight Championship against the challenge of Ricky Steamboat by pulling Steamboat’s trucks at the 20:17 mark of an action filled bout. 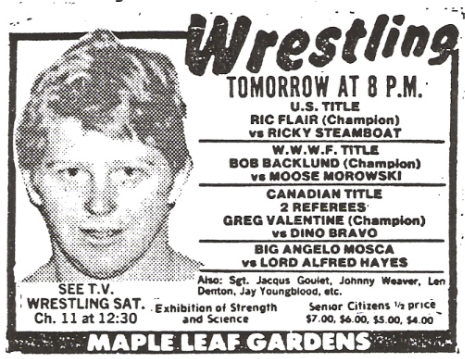 Dino Bravo was also on this super spectacular card in Toronto, defeating Greg Valentine in 14:08 but was unable to lift Valentine’s Canadian Heavyweight Championship belt. Valentine was not active in the traditional Mid-Atlantic area during the month, making only an appearance on the taping of the Mid-Atlantic Championship Wrestling television show on May 23rd defeating Gary Young. Rounding out the Mid-Atlantic matches on this Toronto card, Johnny Weaver and Jay Youngblood took the measure of Len Denton and Sgt. Jacques Goulet in the time of 6:35 in one of the preliminary bouts. An exciting newcomer came on the Mid-Atlantic Championship Wrestling scene during the month of May. “Jumping” Jim Brunzell from White Bear Lake, Minnesota came flying out of the gates, defeating Sergeant Jacques Goulet in his first match in the territory on May 14th in Greenville, South Carolina. Coming from the AWA where he was primarily a tag team specialist, Brunzell told the Mid-Atlantic fans that he had come to the Mid-Atlantic area to see if he could “cut the mustard” as a singles wrestler. Brunzell was definitely a “high flyer,” who had an exceptional standing drop kick and a lethal spinning toe hold. Jim had all the tools, and had the look of a major player as a fan-favorite in Jim Crockett Promotions by the end of the month. One of the championships that Jim Brunzell would cast his eyes upon shortly was the Mid-Atlantic Heavyweight Championship belt of Ken Patera. However, during the month of May, Ken would have his hands full with top challengers like Tony Atlas, Rufus R. Jones and Ricky Steamboat. But the wrestler who gave Patera the most trouble in May was the strongman from Naples, Italy, the Italian Stallion, Dino Bravo. On the Mid-Atlantic Championship Wrestling TV show that was taped on May 23rd, Patera and Bravo squared off over Patera’s “money challenge,” which at this point in time was up to $800. The rules were that if Dino defeated Ken by pinfall or submission within 10 minutes, Dino would get the money and a Mid-Atlantic Heavyweight Title Match. However, before the match even officially started, Patera attacked Bravo and clamped the swinging full nelson hold on him. Somehow Dino managed to escape that deadly hold, and by the end of the 10 minutes had Patera trapped in the abdominal stretch. Patera was able to hold on until the 10 minutes elapsed, and the bout ended in an unsatisfying draw. The result on the May 23rd TV show led to a new challenge the next week on TV involving Dino Bravo. The TV challenge for the Mid-Atlantic Championship Wrestling show that was taped on May 30th had Bravo matched against Patera’s good friend, John Studd. If Dino defeated Studd, he would win $850 and receive a Mid-Atlantic Title Match against Ken. Unfortunately, the Bravo-Studd challenge match didn’t happen on May 30th. Patera came out and told the viewing audience that Studd missed his flight in San Francisco because the DC-10 airplanes had been grounded across the nation. 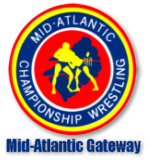 Bravo didn’t buy the excuse, and the new challenge for the next week on Mid-Atlantic Championship Wrestling was for Studd to wrestle Bravo, and if Dino won by pinfall or submission, or if Studd didn’t show up again, Dino would be $900 richer and get a Mid-Atlantic Title match! Also during the month of May, Patera and Bravo had two particularly bitter Mid-Atlantic Title bouts in successive weeks in the port city of Charleston, South Carolina. On May 11th, things got completely out of control to the point that promoter Henry Marcus felt compelled to bring Patera and Bravo back to Charleston on May 18th, this time in a Title match where there would be two referees! The return bout was every bit as crazy as the first, where even TWO referees couldn’t control the action! But because Bravo couldn’t secure a clean pinfall in either match, Patera continued to hold on precariously to his Mid-Atlantic Heavyweight Title belt. In addition to being the Mid-Atlantic Heavyweight Champion, Ken Patera also technically held one-half of the Mid-Atlantic Tag Team Titles with partner and good buddy John Studd. However, the Mid-Atlantic Tag Titles were not defended in the month of May, and appeared to be vanishing from the scene. A very disappointing turn of events for many Mid-Atlantic fans, who remembered the rich heritage that the Mid-Atlantic Tag Team Titles had over the years. 1. Paul Jones---Jones was one-half of the World Tag Team champions, with a number of successful title defenses over Paul Orndorff and Jimmy Snuka, during the month of May. Jones also held the NWA TV Title during the month. And Jones was even feisty enough to mess with Ric Flair during the month! 3. Ric Flair---The “Nature Boy” kept an iron grip on the prestigious United States Heavyweight Championship during the month of May. And if that wasn’t enough, he started mixing it up with fellow rule breaker Paul Jones! 1. Paul Orndorff---Perhaps frustrated with his inability to recapture the World Tag Team Titles with partner Jimmy Snuka, Orndorff’s performance was slipping in his singles matches as well. It wouldn’t be long before Orndorff was out of the Mid-Atlantic area all together. 2. Jimmy Snuka---The “Superfly” also had a very frustrating month, seemingly in a position on multiple occasions to reclaim the NWA World Tag Team Titles, but coming up agonizingly just short on each occasion. 3. Dino Bravo---Frustration also characterized Dino Bravo’s month of May. After multiple shots at Ric Flair’s U.S. belt in April, Dino also couldn’t snare Ken Patera’s challenge money, or more importantly, Ken’s Mid-Atlantic Heavyweight Championship in May.